Spock describes this as "logical" and indeed this premise is one of the things that civil society is based upon. The idea of the common good. The situation in Suffolk with the plans to open a number of small free schools that will benefit a few but cause damage to other schools affecting far larger numbers of people turns this logic upon its head. I first thought of calling this post "the needs of the few outweigh the needs of the many" but actually that doesn't really cover it because this isn't even about the needs of the few. They don't actually need these schools the just want them. To me it seems hugely questionable to use public money to build a new school to compete against an already good existing school. A real case of confusing "want" and "need"
So I think this means that it is really a case of "the desires of the few outweigh the needs of the many" because what, effectively, is being argued is that the desire of some people to make a choice is more important than the needs of everyone to have a good school for their children. "the introduction of the free school would create and incentive to all other existing schools to maintain and improve the education they provide so as to attract pupils. This will benefit all local children"
As I argued in my earlier post this is an opinion and not a fact and it certainly sounds attractive. Choice for all and the ensuing competition also improves the available options. Only problem is it doesn't work like that. This is the educational equivalent to having your cake and eating it. Another way of looking at it is to think about the impact on a town centre of opening a out of town shopping complex. Something many towns know only too well. Such shopping centres were built in large number to increase "choice" so people should "choose" to shop there or in the town centre. Except of course that isn't what happened in many cases. The out of town shopping centres killed the high street stores so there was no longer a choice. You can't have your cake and eat it. People suddenly didn't need (or even want) to buy twice as much stuff so it was "logical" that in the end one would have to close. Yes that's right. 399. Not even 1%. 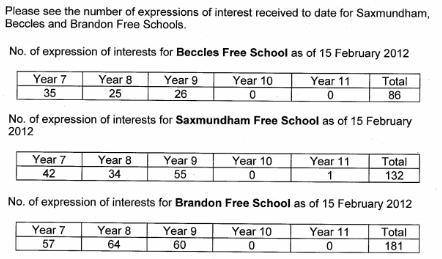 I recently received a Freedom of Information Request from Suffolk County Council containing around 1400 pages of correspondence about free schools in Suffolk. There are countless emails and letters flying around between County Council officers, headteachers, councillors, MPs, the Government and several of its Quangos even solicitors about a handful of free schools. Even if they were all completely full and operating they would only be serving a tiny percentage of Suffolk children yet before they even exist they are consuming a large percentage of the available capacity of the County Council and others. Last night also saw the publication by the parent group Compass who oppose the proposed Stoke by Nayland free school of their response to the recent application to open a free school by Seckford. Their response is extremely thorough and it presents an excellent analysis demonstrating that the proposed schools in just not needed. The report is so good I have attached it in full below to encourage you to read it. Very similar arguments apply in Beccles, Saxmundham and Ixworth.